Pete Smalls is Dead is the title of Alexandre Rockwell’s first movie since 2002’s little seen 13 Moons, a moniker that comes perilously close to describing this weak comedy. The story of one-time screenwriter lured back to Hollywood after his elderly dog is kidnapped by a loan shark is barely coherent and so chock-full of whimsy that it chokes on the stuff. It is tempting to say this is a movie purely for Rockwell completists (if such a thing exists), but it has one redeeming feature and that is star Peter Dinklage’s soulful performance, a glowing beacon in the midst of the wreckage. K.C. 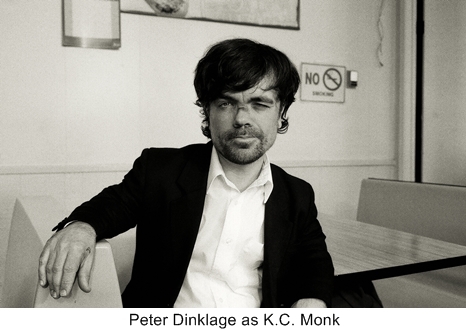 Monk (Dinklage) long ago fled Tinseltown, a one-time screenwriter turned laundromat proprietor. The dog, Buddha, is more than a pet, it’s a connection to his late wife, so when he cannot repay a $10,000 debt and the dog is taken, he is willing to do anything to raise the ransom. That is the situation that make him so vulnerable to a completely harebrained scheme hatched by his old friend Jack Games (Mark Boone Jr.) who informs K.C. that their recently deceased friend, big deal director Pete Smalls (Tim Roth), stole one of K.C.’s scripts for his last, unfinished film. Jack has the idea of using K.C.’s claim on the screenplay to commandeer the film’s rights, which the pair will then sell back at a high price to producer Hal Lazar (Ritchie Coster). Seymour Cassel shows up as a cheerful Armenian gangster. Steve Buscemi (in an awful Afro wig) and Michael Lerner are a couple of slimy, would-be producers. Rose Perez is Pete’s scornful widow. Newcomer Theresa Wayman plays Pete’s editor and K.C.’s wan love interest. There are multiple weak sight gags involving the enormous Jack and diminutive K.C. riding through L.A. on Jack’s ancient scooter. Guys dressed in panda suits pull a heist. The movie’s climactic scenes, set in Mexico, take place amidst a carnival-like atmosphere that is clearly meant to evoke Fellini, but only succeeds in being another loud, tone deaf scene in a movie that is rife with them.